This charming farm house has been lovingly restored and refurbished. It is situated in the peaceful rural setting of Aughnasheelin, approximately 5km from the picturesque town of Ballinamore, 14km from Drumshanbo and 24km from Carrick-on-Shannon. It is within easy reach of many local amenities and is in an ideal place for a relaxing holiday. 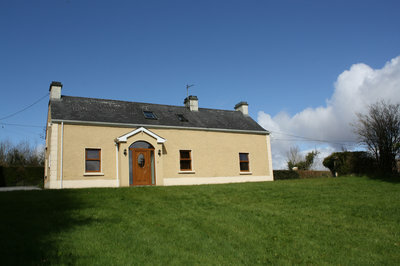 The property can accommodate up to 5 people. Upstairs consists of one double bedroom and one large triple room with a double and a single bed. There is a shared bathroom with an electric shower. Downstairs there is a living/dining room with an oil fired stove - the perfect place to relax. The kitchen is fully equipped with all modern conveniences. There is a separate sitting room with open fire (with the option to use this room as a third bedroom with single bed). The downstairs bathroom is equipped with a bath. The house has central heating and ample private parking. Bed linen, duvets and towels are supplied free of charge. Cot available on request.